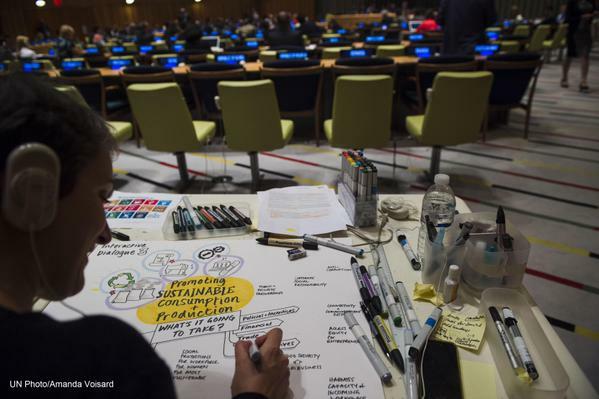 The UN has been abuzz with activity over the past few days as world leaders adopted a new, ambitious, set of Global Goals to end poverty, reduce inequality and tackle climate change. Amid the delegations, staff, protocol and security officers, busily rushing from one event to the next, we went behind the scenes to catch up with two extraordinary people making an out of the ordinary contribution. Johannes Labusch and Rachel Abrams are scribers that have been busy translating ideas shared during debates into explanatory hand drawn pictures. They did between 1 and 5 drawings per meeting and at the end of the day sat down, photographed the panels and prepared them for a slide show presented to countries at the closing of the Summit. “I get the feeling sometimes that I’m helping the speaker make their case because I notice that they’re trying to make a point but they don’t quite trust that it’s coming across and I can help”, Johannes told us before heading back for a third and final day of scribing. Their illustrations record, reflect, clarify and interpret words in real time, appealing to audiences who are tired of click-through presentations and incomprehensible jargon. Asked about the challenges of covering a high-level Summit, despite not being versed in the technical lingo of what was being discussed, Rachel explained that – “There are a small set of what I call “fairy tales”– different types of stories that shape a meeting. The atmosphere of the meeting tells you what to pay attention to so you know whether you’re there to collect statistics or make a case. The most challenging thing is listening to it as if it’s all one message rather than the leaders of one place or another. You hear almost a flatland of the whole discussion with different voices about one thing”. On the experience of scribing at the Summit, Johannes, who is an illustrator specializing in children’s book, said “I’ve learned a lot — hopefully just like everybody else”. Rachel, originally from London, founded her company Turnstone in 2006 and says she has a tolerance for dry, difficult content and loves the complexity of the discussions. “The more dry abstract and massive scale something is, the more appealing the presentation of that content needs to be”. All can benefit from these live drawings, be they academics, activists, educators, and even Heads of State. With words that illustrate and pictures that explain, they are another tool in the effort to promote the Goals to everyone, everywhere. See all the drawings here.